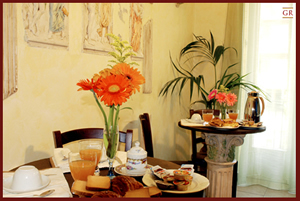 Rome bed and breakfast accommodation: The Bed and Breakfast Giornate Romane offers warm hospitality among the wonder of the eternal city, we prepare lodging in rooms with deprived bath and shared to convenient prices. The everything is comprehensive of stay, cleaning local, change laundry, taxes, rich breakfast, safe-deposit box in own room and tv and conditioned air. The location is central, our b&b is situated to around 15 meters from the stop line B of the subway (stopped Marconi). And well connected from half public forehand to the historical center of the city. In the proximities it is situated the famous district of Trastevere the characteristic district in Rome, with numerous possibilities of night time fun and a great variety of typical inns. The personnel employed to the reception is able to recommend the guests regarding the tourist itineraries in city and outskirtses. Giornate Romane it waits You,we are desirous of set it to Your service.